In European tradition a tree is placed atop a new building once it has been completed. This celebratory ritual, known as “topping out,” has made its way to America, in a modernized fashion, to replace the practice of ribbon cutting. Three years ago, Lena Henke arrived in New York City, a place in which she had always wanted to live. Since then she has continued the steady process of establishing and rooting herself in the community. 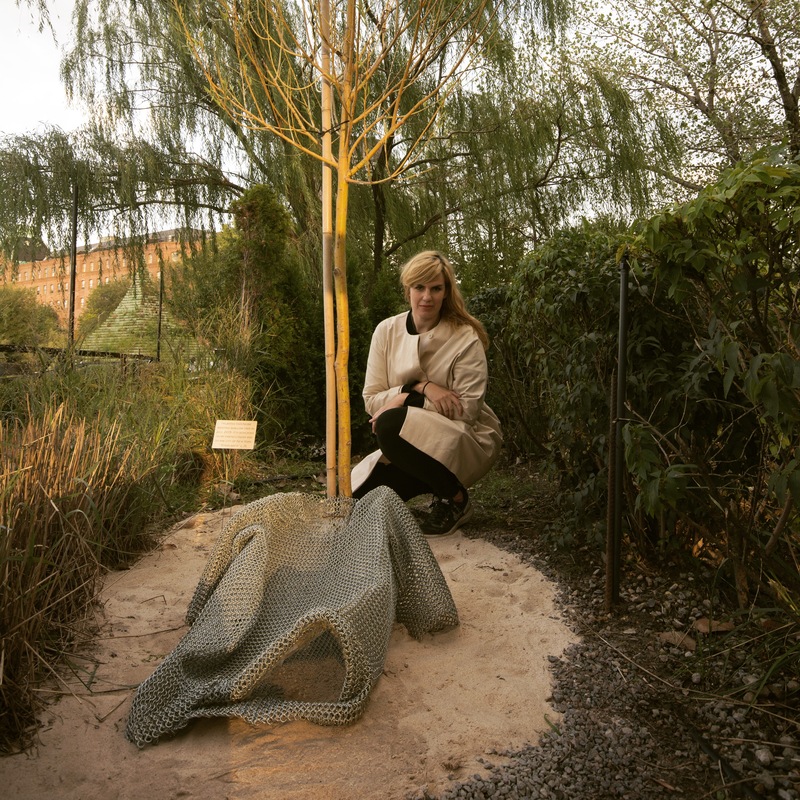 With her EAF15 project, Stand Back (2015), Henke is “topping out” her time in New York by planting a weeping willow tree that will remain at the park after the exhibition closes in March. Accompanying the tree is a figurative sand sculpture that will transform as the weather affects it over time. Referencing the iconic depictions of weeping willow trees in classical painting, Henke has planted her willow tree facing out onto the water. The tree’s branches, which create a curtain around its base, hug the sand sculpture that sits at its foot. “I wanted to use something from the artist’s studio,” Henke says of sand, a material that is typically used as a tool. Her work draws from the historical use of sand in casting bronze sculptures, though instead of using sand as a mold, Henke has decided to make it the main material of her work. “Always when I’m stuck I look at history,” Henke says. From Auguste Rodin to Hieronymous Bosch, she finds inspiration in the works that these artists have created. In her process, she re-contextualizes their works, and evaluates what they mean to her in the contemporary period. Henke hopes that viewers will take in different perspectives while they walk around the piece. “From afar you can see the sculpture as a body, but once you move closer, it can be a landscape of hills and valleys,” Henke says of her work. She draws the relationship from Bosch paintings, which often depict humans interacting on giant bodies. The young weeping willow creates a sense of privacy within the five acre park, with its branches acting as a threshold into and out of the space. “I wanted to create a meeting place that would endure over time,” Henke says of Stand Back. “In paintings weeping willows are a place for lovers, or for someone who is mourning.” She references those that can be found standing solemnly at Cypress Hills Cemetery in Brooklyn, New York. The weeping willow’s full-bodied and fluid structure parallels the curves found in Henke’s figurative sculptures. For Middle Part + Relief V (2014), Henke sculpted the lower half of a female figure using sand. Its partner sculpture, Upper Part + Relief VII/VI (2014), depicts the upper half of a female figure. Both pieces, adorned with chainmail masks, were made to communicate an alter ego that appears in her creation of the forms. “In my piece, nature is taking back the material,” Henke says in reference to the slow disintegration of her sand sculpture. “Instead of me removing it, the wind will just take the grains away.” The sand that Henke has taken from the earth will inevitably return to it. Henke has a solo show at Kunstverein Dortmund in Germany through February 2016.